What Should You Hang on a Rag Tree? By summer, most fairy trees in Ireland are sagging under the weight of misguided offerings. Many are dying from the accumulated damage. Yesterday, my kids and I joined in an effort to save the rag trees on the Hill of Tara. The Tara & Skryne Preservation Group organized a clean up because the two rag trees on the Hill of Tara (they grow together, so appear to be one) were becoming not just unsightly under the weight of inappropriate offerings, but were actually being damaged by them. After seeing the call-to-arms on Facebook, we joined 30-or-so other old souls who cared enough to spend some time cutting the clutter away. Damage to the rag tree at Fore Abbey. Traditionally, people tied strips of linen or cloth to a rag tree as a symbol of their prayer (long before synthetic substances were invented). Over time, these offerings have been replaced by inappropriate modern items (mass cards, glass jars containing candles, coins embedded into the bark, rosaries, dummies/soothers, etc.) and some complete rubbish added by careless people who either didn’t think about their actions or added the first thing they had to hand (nylon string, plastic ribbons, rings, beads, love locks, loom bands, or — strangest of all — socks and underwear–why?). Things that don’t naturally and quickly biodegrade or rot away harm the trees by killing limbs, preventing buds forming and leaves opening, or breaking branches. Over time, others add more bad stuff under the mistaken impression that the items already on the tree are acceptable, and the trees start to weaken and die. It was great to be part of a positive work crew who carefully sliced, plucked, and scissored the detritus away. Anything that looked like a sincere prayer was saved and relocated to the nearby holy well — the original reason offerings were tied to trees, after all — and the trees were left unencumbered and free, looking much the better for the attention. 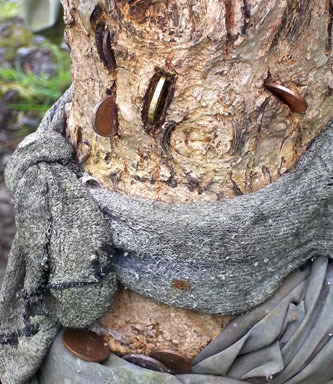 So, what are acceptable offerings to leave on rag trees? Small strips of non-synthetic cloth are traditional. Perhaps they could be draped over the branches, rather than tied to them to avoid pinching the branches or preventing buds developing. Colored paper ribbon (aka crepe paper) should be fine. My kids enjoy making small origami birds out of colorful paper and leaving them perched on the branches. However, even strips of paper or cloth can blow away and eventually enough will litter an area. So, consider a poem, a song, or a smile. Say a silent prayer, savor the peace, and go out into the world renewed. The rag trees at Tara are once more free to reach for the sky and breathe again. Let’s all do our bit to help them stay that way.